The Larson Electronics MPD-480X6-112.5K-12X120-4X240-CWRF-V2 power distribution substation converts 480V AC electrical current into three phase 240D/208-120V 3PH. This unit provides operators the ability to safely tap into and distribute 480V AC power from a variety of sources including generators and direct grid power. The MPD-480X6-112.5K-12X120-4X240-CWRF-V2 portable power distribution system gives operators the ability to power their 480 volt, 240 volt and 120 volt equipment from a single system. 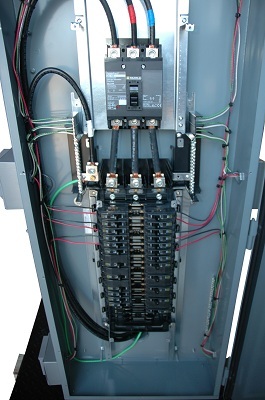 On the primary side, operators connect 480V line-in power using a customer provided cord to six AR642 receptacles for 480V equipment. On the secondary side, operators connect to four L15-30R receptacles for 240V equipment and to twelve GFCI duplex receptacles for 120V equipment. All receptacles are equipped with weatherproof covers. 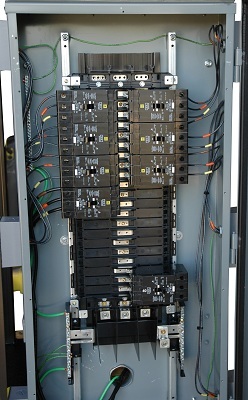 Operation: A customer provided line-in cord brings 480V three phase power to the NEMA 3R 600-amp, 480V three phase main circuit breaker panel, which contains six 60-amp breakers protecing six 60-amp, 480V AR642 receptacles, and passes power through to the transformer. 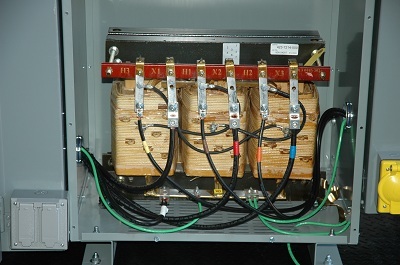 The NEMA 3R 112.5 KVA transformer converts 480V to 240D/208-120V three phase and passes the current to the secondary panel. The secondary side of the transformer feeds a NEMA 3R 200-amp, 240D/208-120V three phase main circuit breaker panel. This secondary panel contains four 30-amp breakers protecting four 30-amp, L15-30R, 240V receptacles and twelve 20-amp breakers protecting twelve 20-amp, 120V GFCI duplex receptacles. Protective Construction: Unlike many portable power distribution boxes made of plastic and utilizing thin gauge, low grade metals in their construction, this unit is designed for serious use and is ruggedly constructed to withstand demanding conditions and heavy duty industrial applications. The transformer is mounted on a 1/8” thick carbon steel plate mounting platform and the load center/distribution assembly is mounted to the standard 2" x 2" x 3/16" thick square carbon steel tubing frame, resulting in an extremely stable, durable, and well protected power distribution platform. This model is equipped with 10.5" x 3.5" heavy duty flat-free tires, fork lift skid pockets, and a top located lifting eyelet which allows easy lifting with crane or chain hooks. Larger units are available upon request and can be equipped with skids or trailer mounted.